A great business needs great leaders. Tailored programmes designed to suit your needs at a range of levels from first line managers to directors. Programmes are aimed at improving both personal performance and business results. They can also be linked to ILM qualifications. Change is natural, but sometimes we need a little help with it. Change management strategy, visions, goals and purpose and how to embrace change on a personal level. For you, for your business leaders, for your teams. Teambuilding events, assessments, personal profiling and “barrier busting”. 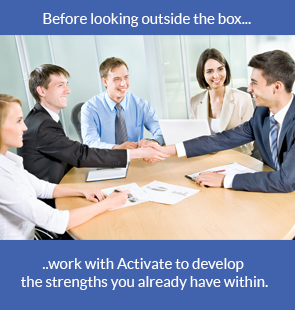 Activate can help you develop your workforce through a range of programmes including communication skills, project management, interview techniques, sales and customer service and coaching to improve performance.